Welcome to Black Bear Falls, the beautiful log home resort community that will leave a lasting impression, with its unique features. This visually stunning resort was awarded Gatlinburg's Environmental Design Award of Excellence for its extensive landscaping and front entrance sign. Black Bear Falls is located on over 43 acres of natural springs, ponds, cascading waterfalls, and streams in Gatlinburg, Tennessee. 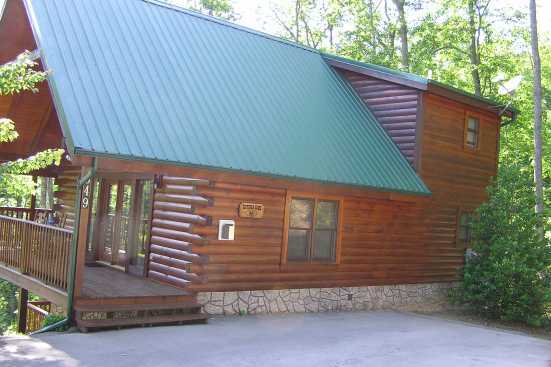 The resort is conveniently located nearby Pigeon Forge, Dollywood, and the Great Smoky Mountains National Park. These custom log homes provide breathtaking views of the Great Smoky Mountains and Ober Ski Resort. Black Bear Falls includes access to a log clubhouse that can be rented for gatherings, small weddings, reunions, or business meetings. Other perks to this community include two heated swimming pools, a spacious covered patio area, outdoor hot tubs, and private back decks. Amenities typically offered within the cabins include free wi-fi, heat and A/C, gas log fireplaces, washers, dryers, refrigerators, and stoves. Exciting attractions nearby include shopping along the Parkway, hiking, biking, or horseback riding in the Great Smoky Mountains, and checking out Ripley's attractions. Book your Black Bear Falls cabin directly with SMBYO.com This page has an owner button and the owners phone number, so you can handle your booking directly with the owner.